Abstract: What makes the MSI G4MX440-T8X special is that it is a entirely silent half height card especially suited to small form factor PC's. While ATi and nVIDIA battle it out for the performance crown it's actually their mainstream/budget videocards that bring in most of the money. Win the mainstream battle and you'll win the war as they say. To this effect, nVIDIA know that their TNT2 M64, GeForce2 MX and GeForce4 MX line of videocards have long been popular with manufacturers and OEM's. It's not that ATi cannot offer the same type of product, it's just that until recently ATi has been focusing more on being a performance leader and offering competitive pricing on their flagship line of cards only. Today we're going to be looking at yet another GeForce4 MX videocard, but what makes the MSI G4MX440-T8X special is that it is a entirely silent half height card especially suited to small form factor PC's or Book sized PC's. Based on the GeForce4 MX440SE core it has 64MB of Samsung 5ns TSOP-II memory. With an 'unfailable' passive black heatsink, the card is clearly targeted towards OEM's and/or lower end videocard buyers with moderate gaming demands who only need the graphics capability to run office programs and internet browsers. The only "frill" is the on board TV-Out option which is based on an integrated (albeit unknown) video codec. 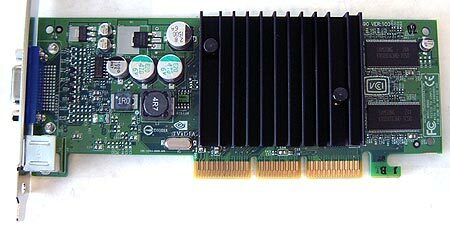 Based on a standard PCB, the MSI G4MX440-T8X is quite a small videocard, and could be useful for servers as small as 2U who are without on board video options. Even though this is clearly a budget videocard, I was pleased to see that MSI used a good amount of thermal paste between the GPU and heatsink. With the memory by default clocked at 400 MHz, the 5ns Samsung DRAM did not get hot at all even when overclocked. The black aluminum heatsink on the other hand got extremely hot at stock, but we were still able to get a good overclock. I know that MSI is trying to keep costs down, but perhaps they should consider using a larger passive heatsink - but in any event, good airflow is a necessary to keep this video card at reasonable temperatures. Please keep in mind that 8x AGP for the GeForce4 line of cards (Ti and MX) is enabled, but there are no real benefits per say. Now just because the G4MX440-T8X is a budget videocard doesn't mean we aren't going to spare it from the overclocking tests. =) We've had quite a bit of luck overclocking MSI videocards in the past, and we were hoping (almost expecting) a good overclock out of this card as well. Based on the GeForce4 MX440SE GPU, the core was clocked at 250 MHz (25 MHz lower then a regular MX440/MX440-8X) and the memory was humming along at 400 MHz. We first began to raise the core speed slowly 5 MHz at a time; 275 MHz came and went quite easily as did 300 MHz (default speed of the MX460 core). To my surprise the little G4MX440-T8X maxed out the coolbits slider at 315 MHz with absolutely no problems. Not satisfied with the 65 MHz overclock I installed Powerstrip and tried for higher. As with coolbits, we also maxed out the Powerstrip slider at 332 MHz, but unfortunately this time we didn't have a work around for the core speed limit. The memory was not to be out done by the awesome core overclock. We raised the memory frequency 5 MHz at a time as well and like the core we hit the 500 MHz memory limit in coolbits as well. With Powerstrip, we were again able to totally max out the slider this time at 540 MHz memory speed. I'm sure the card could have gone higher if it wasn't being limited by the software, but still, an 82 MHz core and 140 MHz memory overclock out of a budget videocard is still quite amazing!